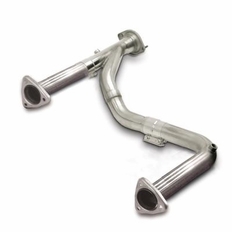 Dynatech SuperMAXX Stainless Steel Race Mid Pipes (Non-Catted) are the perfect item to combine with your Dynatech SuperMAXX Headers for a complete bolt-on installation on your vehicle. Designed for racing and maximum flow, these SuperMAX Intermediate pipes eliminate your catalytic converter(s). They outflow the OEM mid-pipes by a wide margin, resulting in improved power. Designed with high quality "ball and socket" connections, this intermediate pipe will connect directly to your Dynatech SuperMAXX Long Tube Headers and then to your factory or aftermarket cat-back exhaust. The part number for this item is 715-84130 and it fits 2000-2006 Chevy Silverado, GMC Sierra, Suburban, Tahoe, H2, Cadillac Escalade (6.0 V8 Models) with Dynatech SuperMAXX Long Tube Headers. This item is not designed to bolt up to OEM Exhaust Manifolds, only Dynatech SuperMAXX Headers (Dynatech Header part 715-74110, which is sold separately). We Guarantee the lowest out the door price on Dynatech Headers. If you find the same Dynatech part number for sale somewhere else for a lower out the door price, we will match or beat the price. Simply give us a call at 866-639-5385 during regular business hours and direct us to where we can see the better price. We think our prices on Dynatech Headers are very competitive, but if you think you've found a better deal, we want to know!